Everything You Ever Wanted to Know About Gaming... But Thought You'd Be a Geek If You Asked. Hailed as the best source of information ever created about Roleplaying Games, this is the single most important book any gaming fan - or anyone who wants to understand RPGs - could hope to own. Did you know H.G. Wells helped start the hobby? Do you know what was the very first roleplaying game ever played? Discover decades of gaming history, complete right up to the end of the millennium. Where are the best and most interesting games going today? Who are the top companies? What games are the best sellers? Find out inside. What IS a roleplaying game? How do you find players? Where do you play? How do you choose what game to play? Just how does all this work? The entire hobby is explained and "de-mystified" right inside this book. 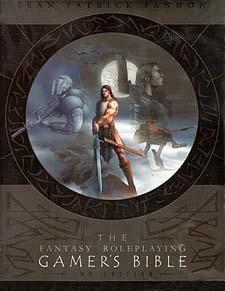 Best of all, The Fantasy Roleplaying Gamer's Bible is written in a fun and conversational manner, meant to be as enjoyable to read as the games are to play. Find out what thousands of fans discovered with the First Edition - that this really is the BEST book about gaming ever written.